The official retail price of Microsoft Office 2010, the next version of popular business productivity software from Microsoft, has been revealed. Microsoft had earlier released free Office 2010 beta downloads to general public, and revealed versions (editions) of Office 2010 will be available in. 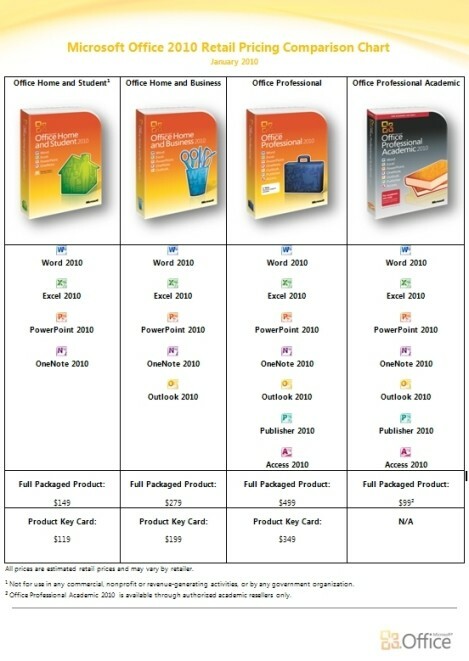 Office 2010 will be available in either boxed full packaged product (FPP) version, which license authorized installation of Office 2010 product on two computers, except Office 2010 Home and Student, which available as Family Pack, and can be installed on up to three PCs; or “product key-card” (PKC) version, where the activation card contains only product key to activate the unlock the Office 2010 pre-loaded and pre-installed on the new computers, without a physical CD media. Office 2010 may have discontinued the upgrade versions of Office 2010, where substantial discount been giving the customers with previous version of Office productivity software. However, for people who doesn’t want to pay and pay again, an ads-supported version of Office 2010, Office 2010 Starter (Office 2010 Starter Beta is also available for download) will also available on new PCs. For Office 2010, Microsoft is also offering a Click-to-Run method of software delivery mechanism. Essentially, it’s a new way of delivering and updating the Office 2010 products based on core virtualization and streaming technologies of Microsoft App-V, allowing end-user to use the software almost instantly. With Click-to-Run, Office 2010 is virtualized in a virtual machine and streamed from the cloud to desktop, allowing Office 2010 to co-existed with existing and older version of Office productivity software. Click-to-Run delivery is available for both the Office Home and Student 2010, and Office Home and Business 2010 products on both 32-bit and 64-bit Operating Systems (although only the 32-bit version of Office is actually run on both platforms). Full language support is available. Office 2010 is scheduled to be officially released on June 2010, and requires the following hardware specifications requirements.